This adorable eternity wedding ring showcases fifteen Princess cut diamonds set in a bezel setting to gain prominence even more. A wedding ring that surely turns heads. 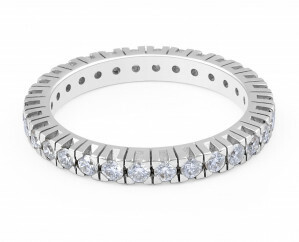 A stunning vintage style 18K white gold eternity diamond wedding band. The ring has 38 round diamonds totalling 0.70 carat. 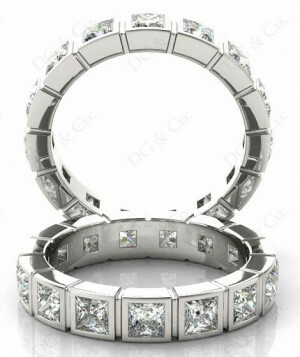 The band has an intricate cut design underneath the channel set diamonds. This ring suits a classic woman who appreciates traditions. Modern design 18 Karat yellow gold diamond wedding band finely set with 5 sparkling round brilliant diamonds totalling 0.10 carat in a classic channel setting. 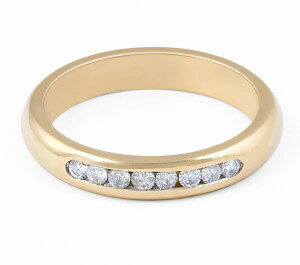 A great choice of wedding band for those looking for a modern and classic design. This attractive diamond wedding ring showcases a shimmering square shank and 21 channel set round brilliant cut diamonds. A choice of utmost delight and sparkliness. 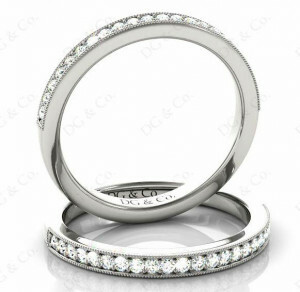 This Delightful Annivarsary wedding ring features 18 round brilliant cut diamonds embellished with subtle millgrain edges for a bright and sparkly future together. Classic design 18 Karat White gold diamond eternity wedding band elegantly set with 30 exquisite round brilliant diamond throughout the entire band. The fine cornered prong setting gives the ring a classic smooth finish. 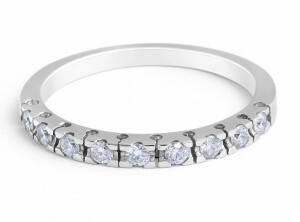 An absolute stunning eternity wedding band for the future bride to be! 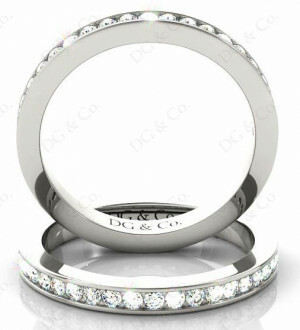 This classic 18 Karat White gold wedding band is set with 9 beautiful radiant diamonds. The diamonds are set in a corner setting allowing the edges around the diamonds to be smooth and dense to avoid catching on clothes. 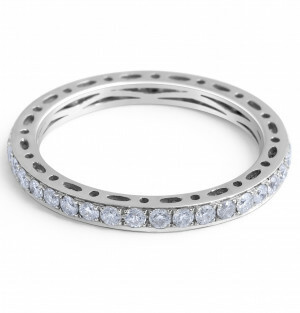 The elegant slim band makes it the perfect choice to compliment the engagement ring!